This is the time of year when teachers are reflecting over last school year and making plans for next school year. One change you should consider for next year is adding a few foreign language lessons to your curriculum. Adding these at the beginning of the year will make your students who hear other languages spoken at home adapt quickly to your class. It shows them that other languages are valued. Let them be the leader for these lessons. These also make great lessons for your Celebrations Around the World unit. Foreign language lessons aren’t just for the E.S.L. / E.L.L. teachers! I asked my friend, Yvonne, to share some easy lessons that a regular ed. teachers could use. Did you know you can add a little foreign language into your classroom without much effort at all and without even knowing how to speak the language yourself? Here are three easy things that you can do to help enrich your students and give them a little head start in their foreign language learning. #1 – Find videos on YouTube to help your students learn basic things like polite phrases, colors and numbers. Hopefully you have internet access in your classroom. If you do, you can pick out a few foreign language teaching videos ahead of time that you can play for your students. If you don’t have internet in your classroom, you can download videos to a thumb drive at home and then use the videos for your class at school. Also, because there are pronunciations on the videos, you can learn with your students if you do not speak a foreign language! #3 – Teach your student a song in a foreign language that they already know the melody to in English. This is a great method that I have used a lot in classes. Not only does it give your students an extra confidence boost, it’s easier for you as well. A song like Head, Shoulders, Knees and Toes is a great one to teach because your students can point to their body parts as they practice the song. 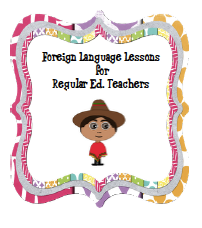 Visit here to find more Foreign Language resources for your class. Thanks for some great tips! My class teams up with the first-grade bilingual class during science and other activities, so I will be trying some of these ideas next year. Many of my students already know how to speak fluent Spanish, but for those who don't, they're sure to get a kick out of it!